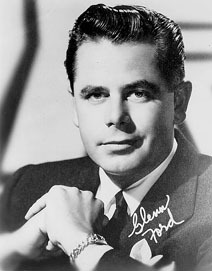 Glenn Ford was born in Canada, where his father was a railroad conductor. The family moved to California when Ford was eight, and he grew to think of himself as an American. He attended Santa Monica High School, where he appeared in several school plays. His first professional role was in a stage production of Lillian Hellman's lesbian melodrama The Children's Hour. He became a naturalized U.S. citizen in 1939, and served in two wars. In 1941, months before Pearl Harbor was attacked, Ford joined the Coast Guard Auxiliary, where he was on duty some evenings and occasional weekends. Already a movie star, he asked for "regular duty", to be treated as one of the guys, not a celebrity. He later put his acting career on hold to fight in World War II, serving in the U.S. Marines from 1943-45 and seeing action in the Pacific. When he was discharged he signed up with the U.S. Naval Reserves, where he served for decades, rising to the rank of captain. He visited U.S. troops in Korea and Vietnam on well-publicized morale-building trips during those wars. And in a 1993 interview Ford confided that he had also been sent on five secret missions into Vietnam during that war. Asked for details, all he would say was, "They asked me to go, and I went". Ford also signed on with the French Foreign Legion, while filming The Green Glove in Europe in 1952. He went out for a night of heavy drinking and the next morning discovered he had joined. After four days of arguments and apologies, he got out of it when the film's producer explained to a Legion officer that if they kept Ford, the movie would have to cease production, and about 150 Frenchmen would be out of work. Early in his career, Ford was a noted womanizer. For several years he shared a hotel room with friends and fellow star William Holden -- they were never there at the same time, but either man could bring women for trysts. In addition to his four wives, Ford carried on a long-time affair with his six-time co-star Rita Hayworth. He was also a close friend of Charmaine London, Jack London's widow, although it remains uncertain whether their relationship was platonic or romantic. Ford made more than 90 films, but if present-day audiences remember him at all, it is for his small but heart-tugging performance as Pa Kent, Superboy's adoptive father in Superman, with Christopher Reeve. His Blackboard Jungle with Sidney Poitier is considered his greatest, but Fate Is the Hunter with Rod Taylor still soars, too. Ford also starred in several terrific film noir pieces, including the classic Gilda with Rita Hayworth, Fritz Lang's The Big Heat with Gloria Grahame, Émile Zola's Human Desire with Grahame again, plus a few fading noirs from the '60s, The Money Trap with Elke Sommer and Experiment in Terror with Lee Remick. He handled light comedy adroitly in Frank Capra's Pocketful of Miracles with Bette Davis, Teahouse of the August Moon with Marlon Brando, and It Started with a Kiss with Debbie Reynolds and Eva Gabor. In the film The Courtship of Eddie's Father, years before the sitcom, he played the Bill Bixby role to little Ron Howard's Eddie. Almost half his films were westerns -- Anthony Mann's Cimarron, The Desperadoes with Randolph Scott, or The Man from Colorado with William Holden. He also played well against type as the bad guy in 3:10 to Yuma with Van Heflin. A brief cameo in the Kurt Russell's 1993 western Tombstone was going to serve as Ford's farewell to cinema, but due to health concerns he was unable to play the role. He also had two short-lived TV series in the 1970s, playing a cop on Cade's County with Edgar Buchanan, and later playing a preacher on The Family Holvak with Julie Harris.